During the past week or two not much has changed with the bedroom. My mom had taken the two old doors that I’m going to turn into a headboard home with her to finish sanding and priming them. 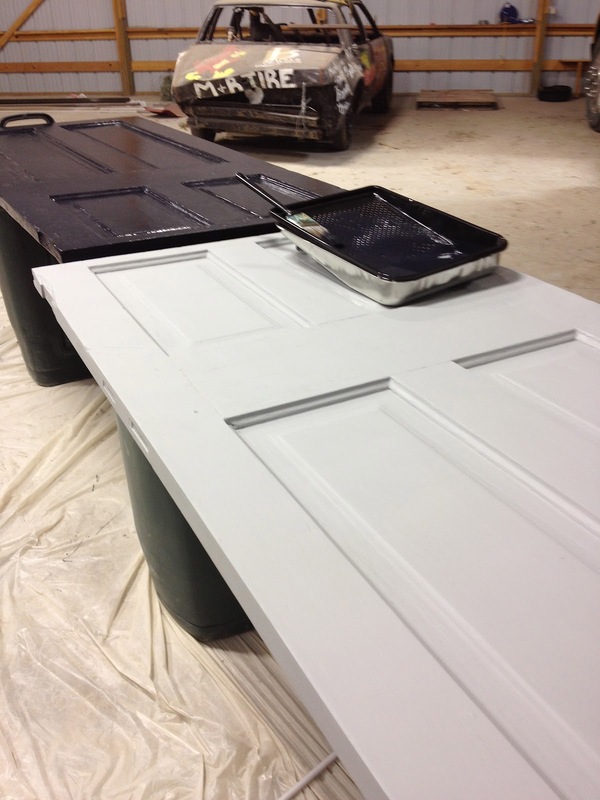 I got them back this past Monday so now I’m in the process of two coats of black paint, distressing and then two coats of the Minwax Polycrylic Protective Finish. I should be done with that tonight and then I want them to sit and dry/air out for the next few days. I’ll have Kevin help me put them together and attach them to our bed frame before the 4th of July (hopefully)! 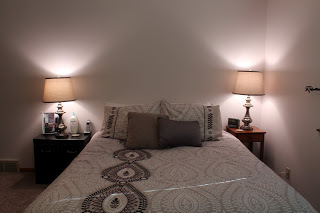 I finally remembered to take pictures of the furniture in the room and our new bedding! The lightening wasn’t working with me, so some of the colors aren’t really the best, but I’ll take better ones when it’s all done! This is the view from the doorway when you walk into the bedroom. I really like the duvet cover and pillow shams that I ordered from Bed, Bath and Beyond. It’s just so hard to tell what things look like on the internet, so I was keeping my fingers crossed until they arrived. Obviously hang the headboard (soon!). Paint jewelry box and hang painted mirror above it. Find a new home for the laundry basket since the rocking chair that is in HD’s bedroom next door will be moved into our room as soon as we get him a toddler bed. The new baby and HD are going to share a room for awhile. We’ll see how that goes! Sew pillow covers for decorative pillows on bed to add some color to the room. 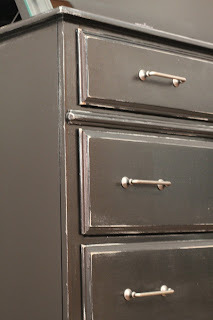 Find matching nightstands and paint/distress them to match other furniture. 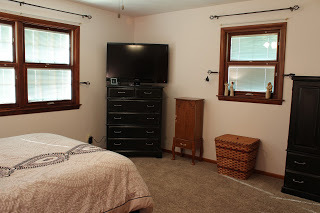 Figure out some artwork or something to hang above the dresser on the right. The bed will look so different once we bring in the black headboard! I can’t wait! It’s just so bare right now! Someday we want to replace/update all the old trim and doors in the upstairs. The trim around the windows is all new as of a few years ago when we had Pella windows put in, but it doesn’t match the old orange colored trim that is from the 60s when the house was built. Slowly but surely we’ll get there! 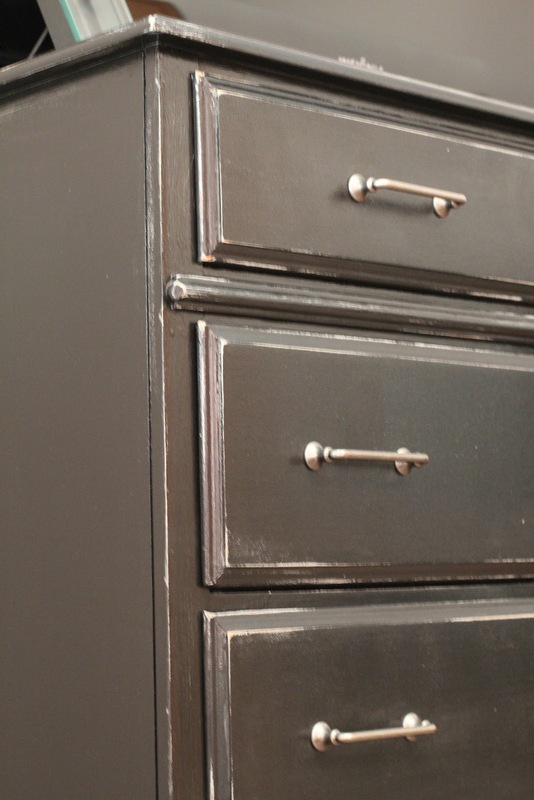 These close ups of the dresser don’t do them justice! I love how they turned out! And the hardware looks great too! I have a fairly decent stash of material downstairs in the guest bedroom/my craft room. I just happened to remember that I had some fabric leftover from the shower curtain that I made (with my mom’s help) a few years ago. That shower curtain is hanging in the bathroom right across from our bedroom and is also gray walls, with black granite countertop and dark wood. Kind of like our new bedroom colors! So I’m thinking about getting a couple of bigger pillow forms and making covers out of the dusty blue material and then some different smaller pillows will be covered in black and I need to find a grayish/purplish material to match the color in the teardrop design. It’s kind of nice to use what I already have! Stay tuned for the headboard update that will come next week! Maybe I’ll have the curtains and pillows figured out by then too! « Mommy Monday: Fun Weekend!